Seery Strings | Try it on a Cheap Violin First? Try it on a Cheap Violin First? As a luthier, I often get customers coming in with violins (violas and cellos too) which were purchased online, for sometimes as little as $60 or so. These instruments are very low quality, and I really don’t consider them violins at all. Violin-shaped-object is a more accurate assessment. People argue that they want to try it first before they buy something better and it will be the purpose of this article to explore whether there is any value in that line of thinking. I believe many people underestimate the challenges of learning an instrument, but after spending some years as a music teacher it is clear to me that the bowed strings are much more difficult in the initial stages than other instruments. Holding the bow is unlike anything else we hold and use in daily life. Drawing that bow across the strings to produce a pleasing sound is challenging for a beginner, even on the best of instruments. The curvature of the bridge is very important to make it possible to bow one string at a time. Holding the instrument properly and positioning the left hand can also pose some difficulty for many. These basic techniques can often take months to become proficient at. Then players will spend the entirety of their playing tenure making adjustments to these basic techniques as they progress. These challenges are enough–who would want to put more obstacles in the way of this uphill climb if they can be avoided? Instrument set-up is the key to success on any instrument, but particularly with the bowed strings. Set- up can easily be (and often is) the difference between success and failure. Instrument tone is important for beginners as well. If a better violin cannot be afforded through either rental or purchase, then I would agree that it is better to try it than to not. However, if there is any way to afford a better instrument, the chances of successfully achieving your musical goals skyrocket! 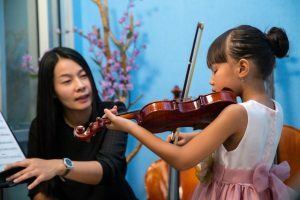 I explain in detail the true hidden costs behind purchasing a $60 violin or $175 cello in the article “The Real Costs of a Cheap Violin.” As I have explained in this article though, there are more than just monetary costs, there is a huge cost to the chance of succeeding on your chosen instrument.